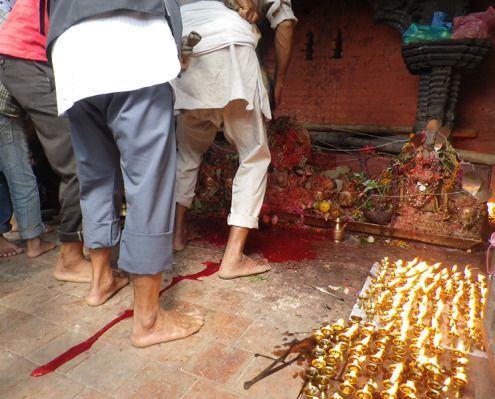 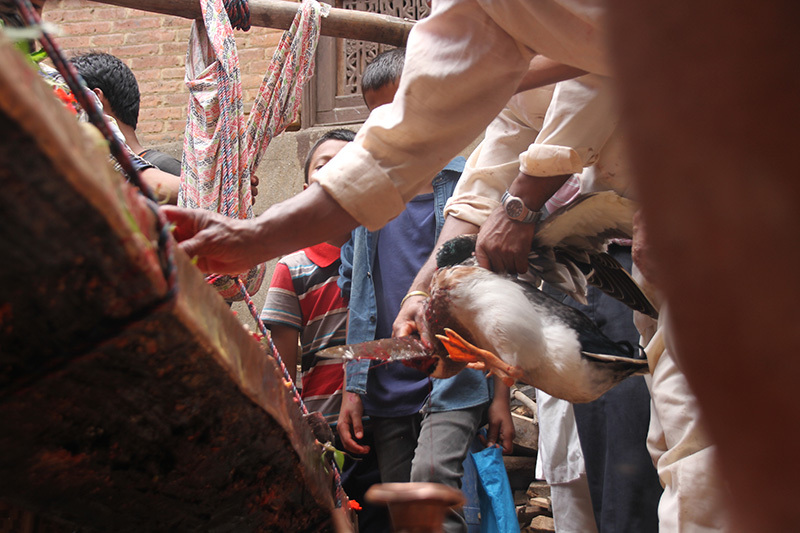 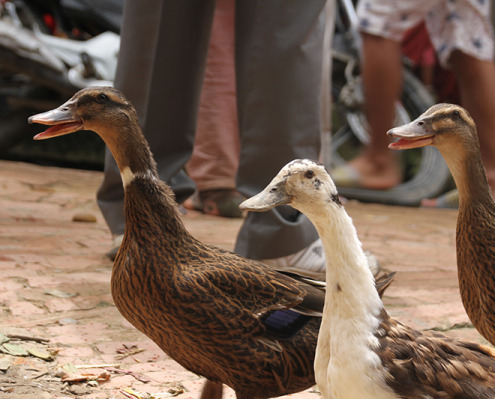 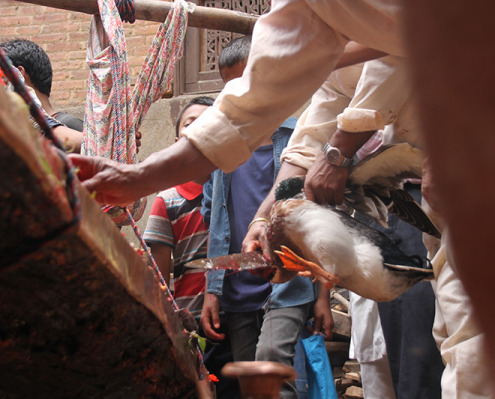 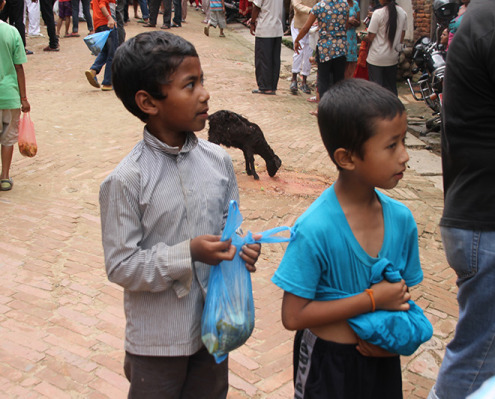 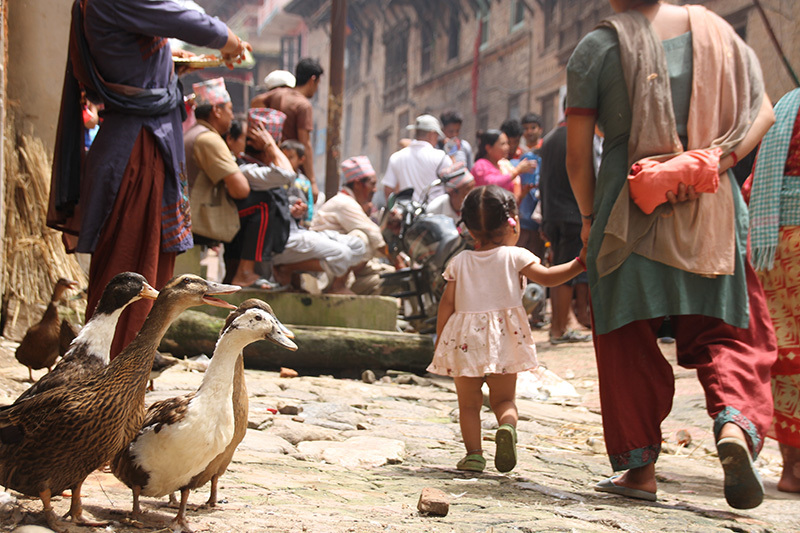 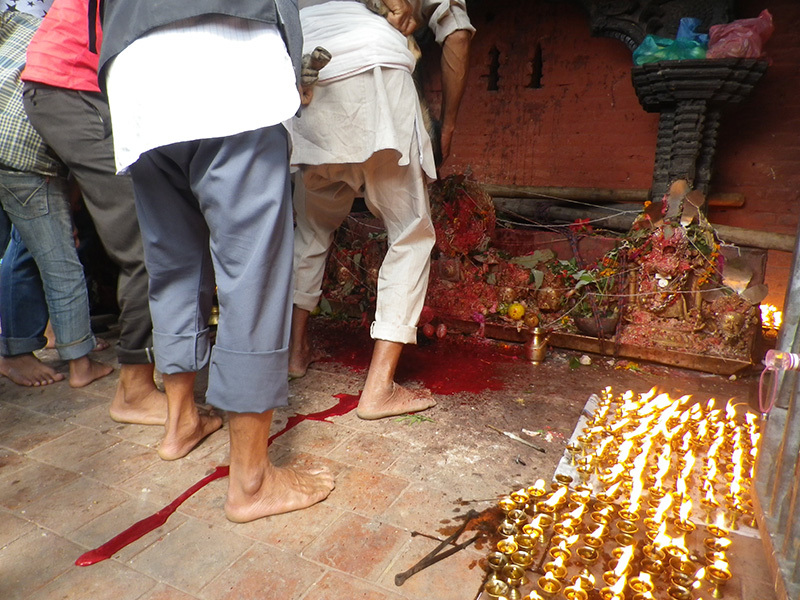 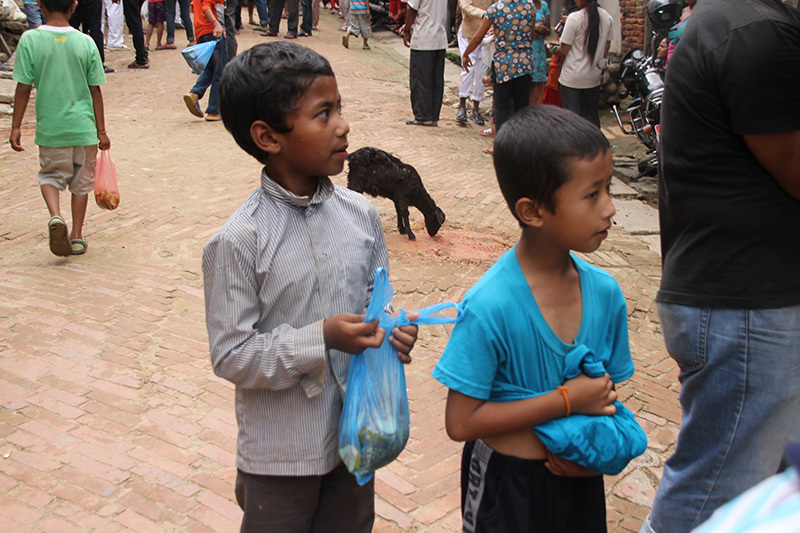 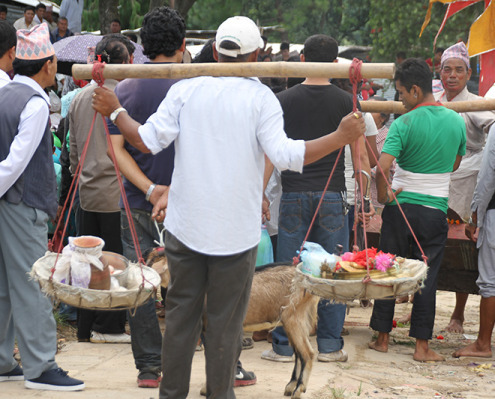 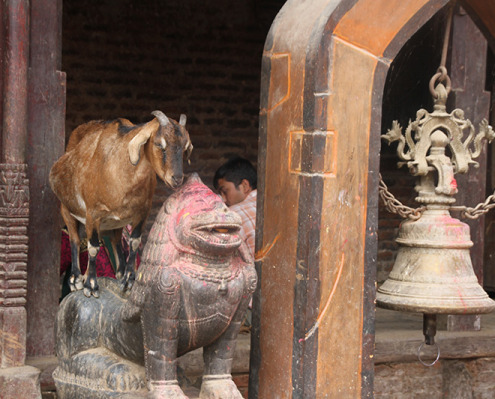 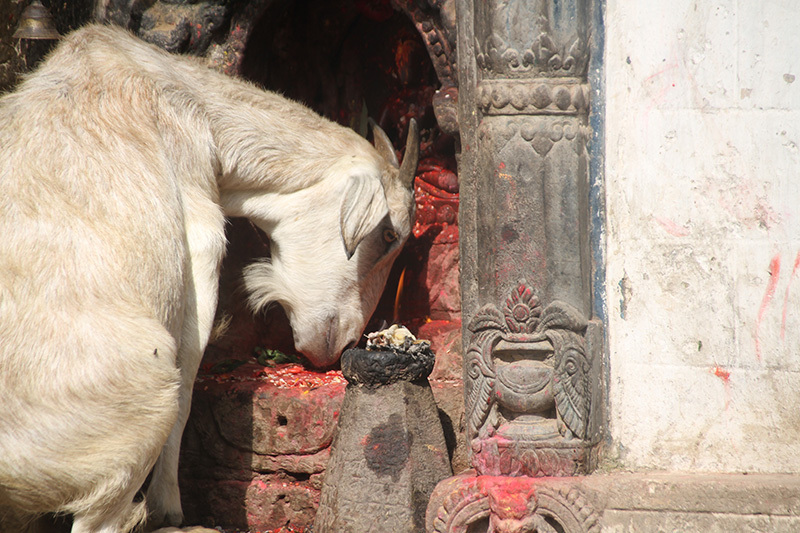 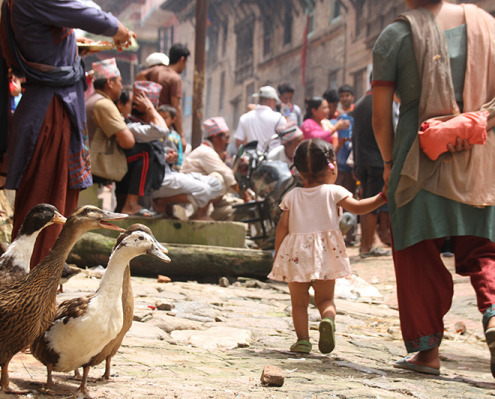 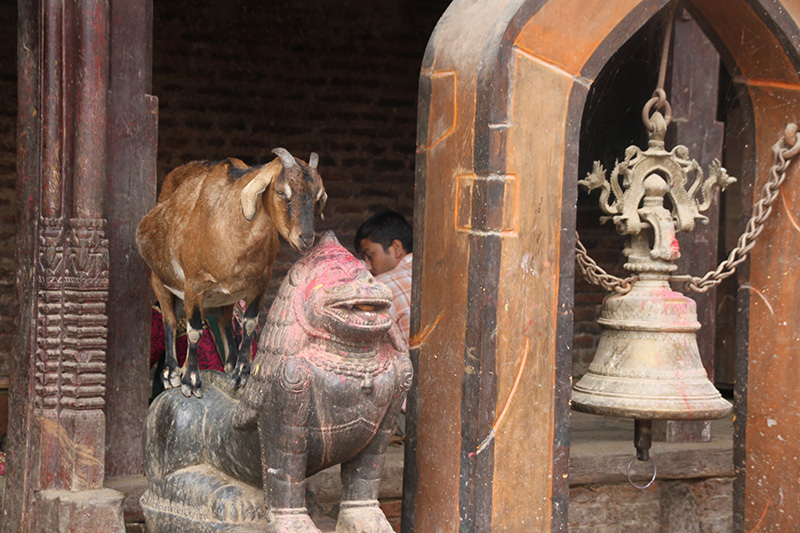 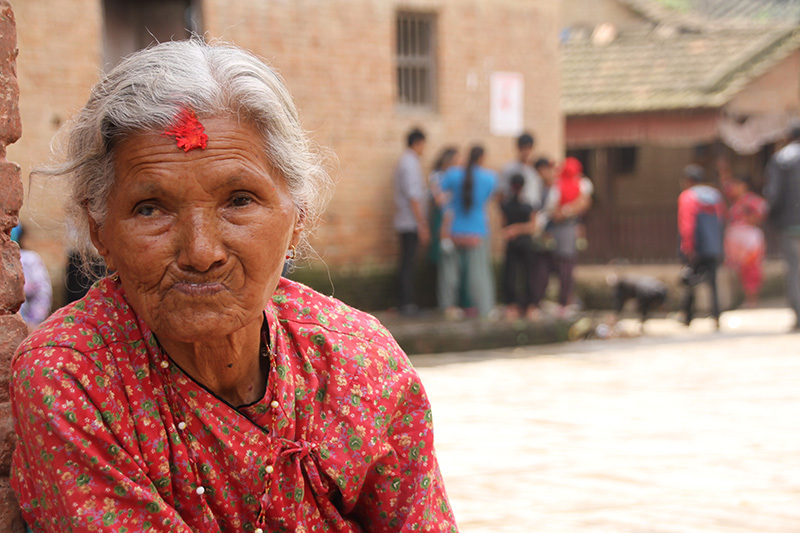 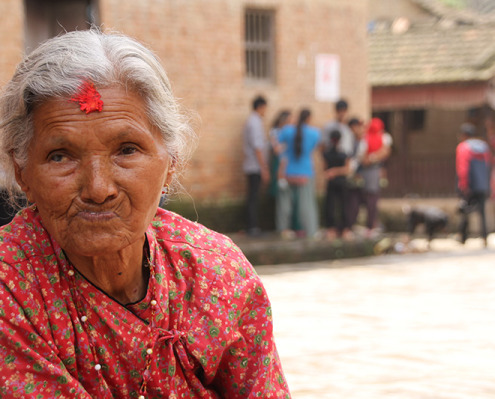 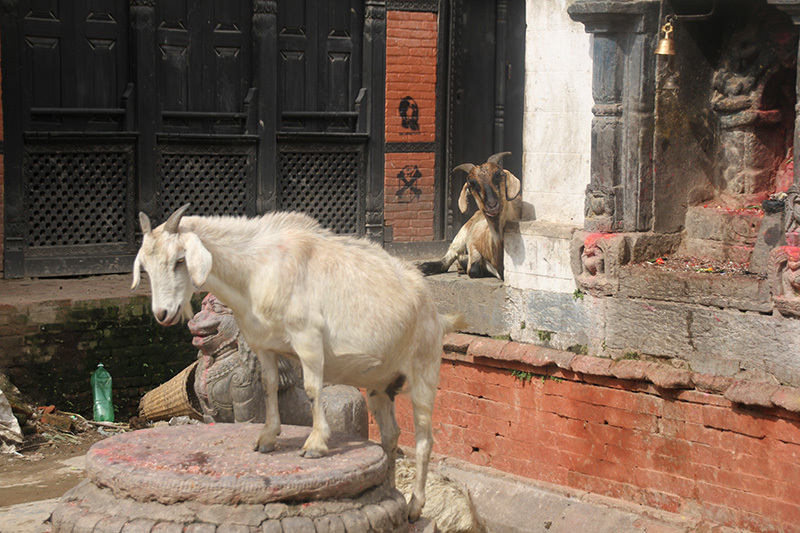 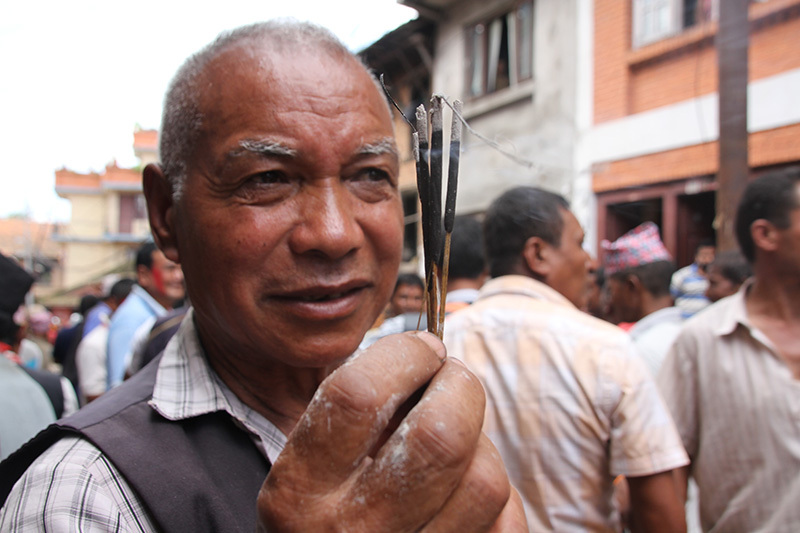 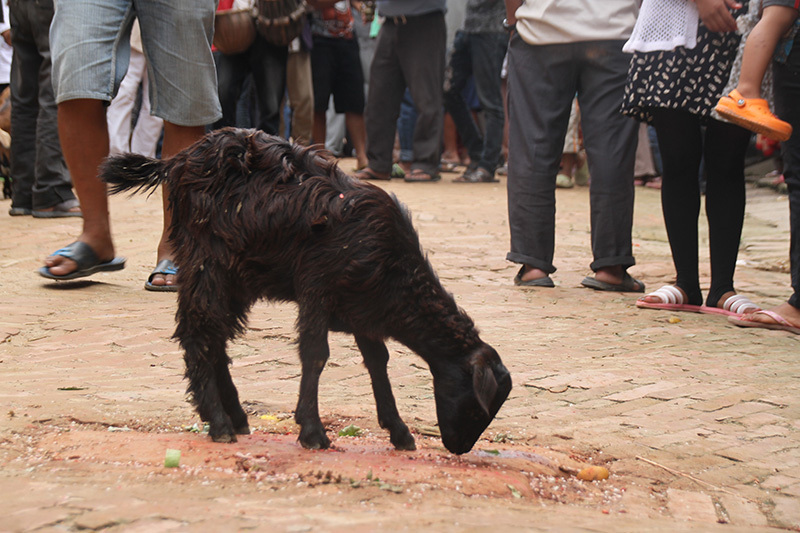 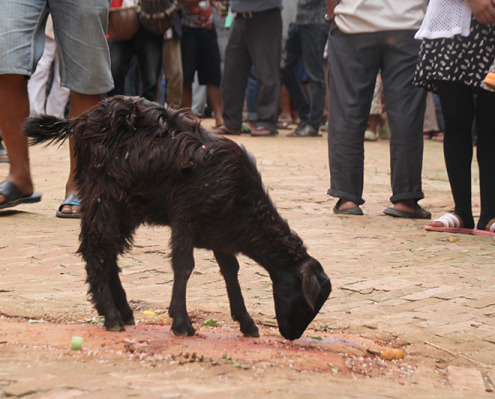 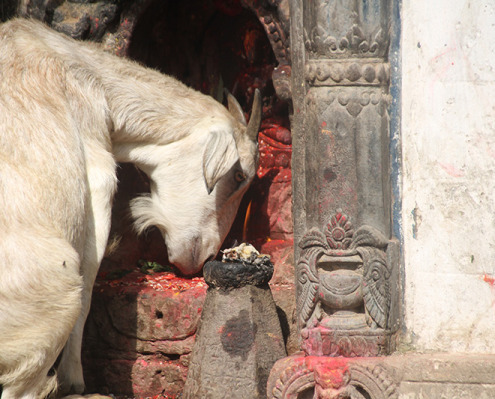 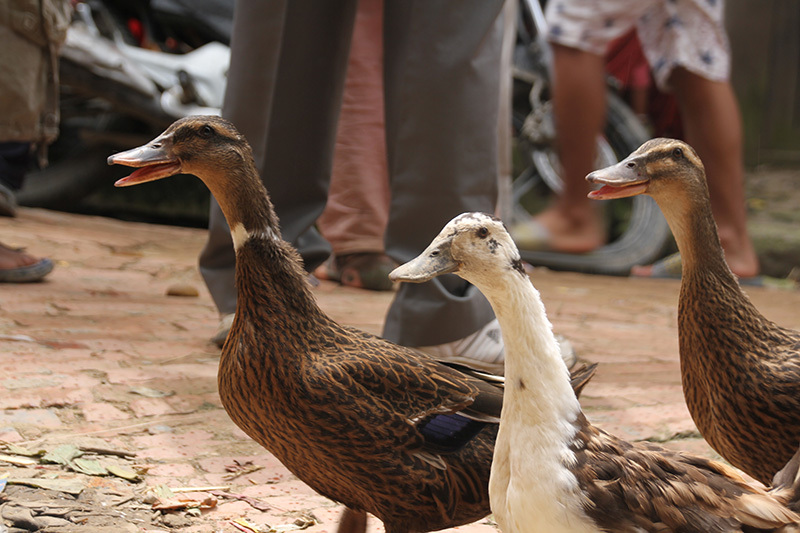 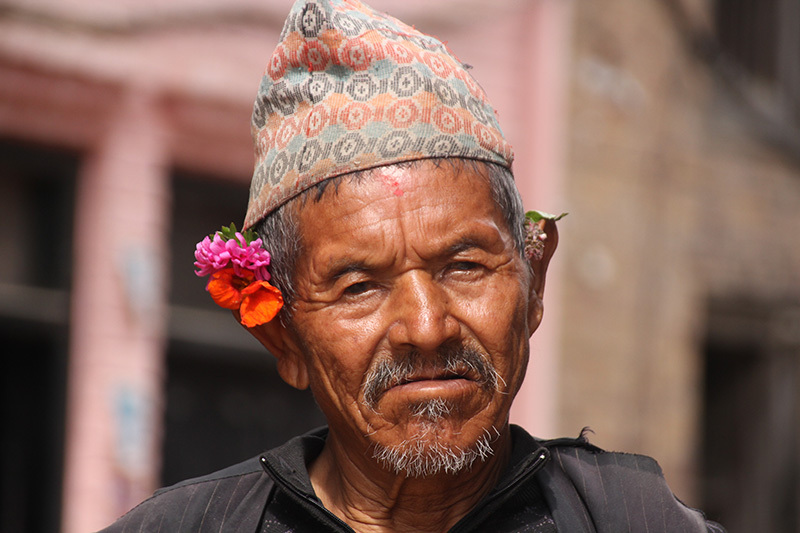 In August of 2015, Animal Recovery Mission investigators went undercover to document an unimaginably barbaric animal sacrifice event, part of a 900 year old tradition, that occurs every year in the small town of Khokana, just eight miles outside of Kathmandu, Nepal. 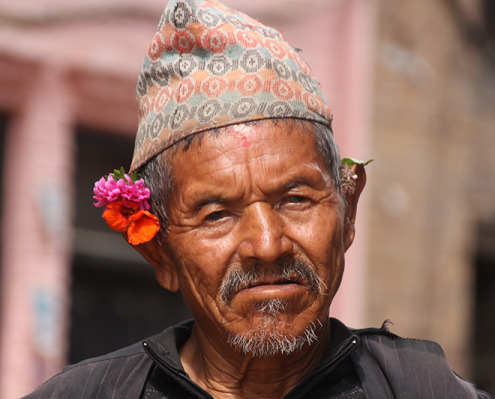 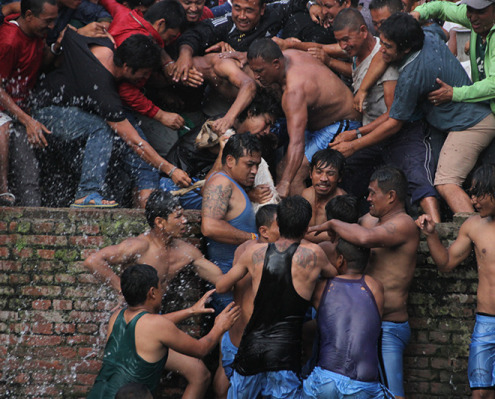 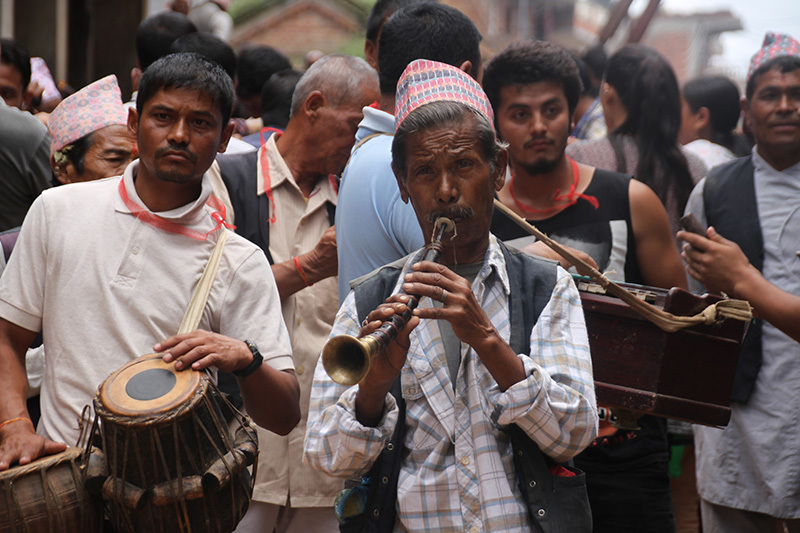 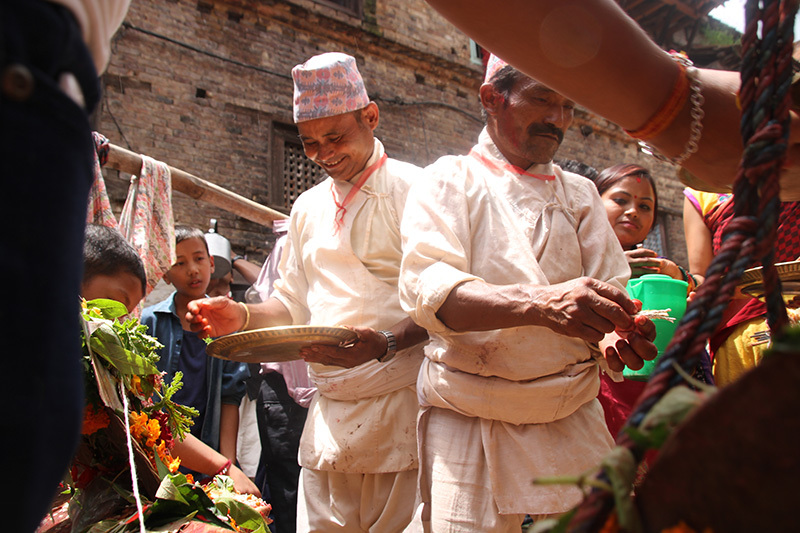 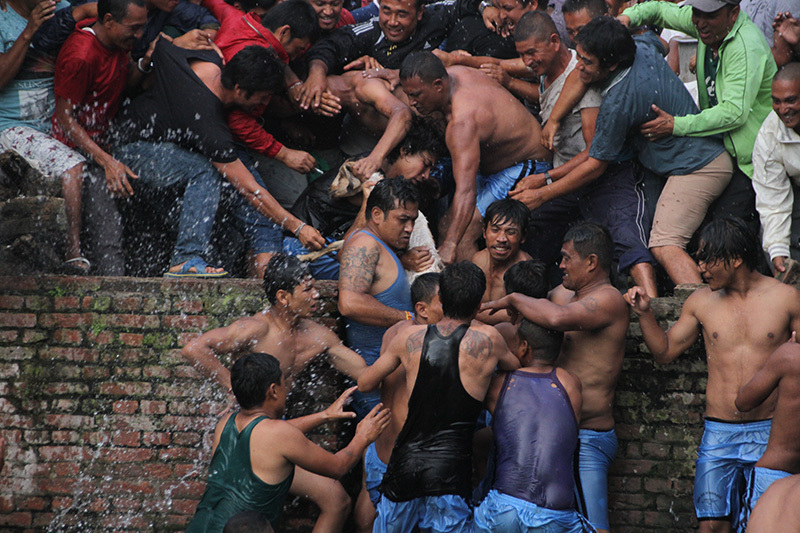 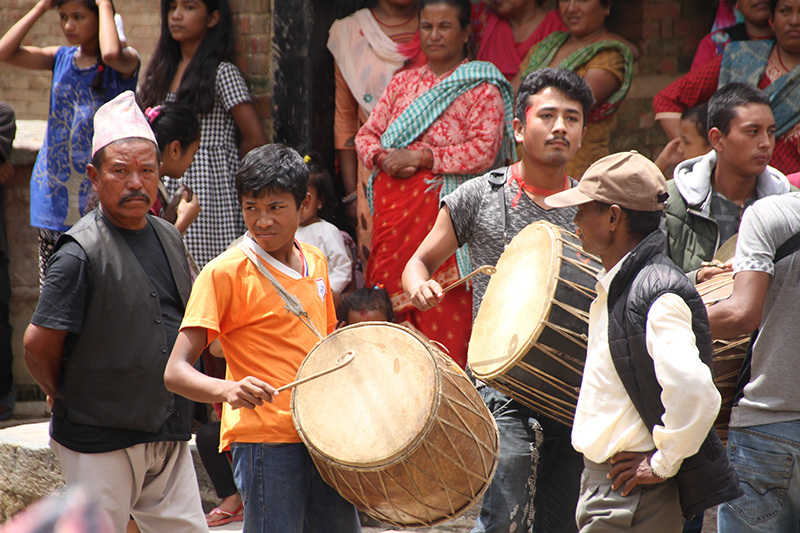 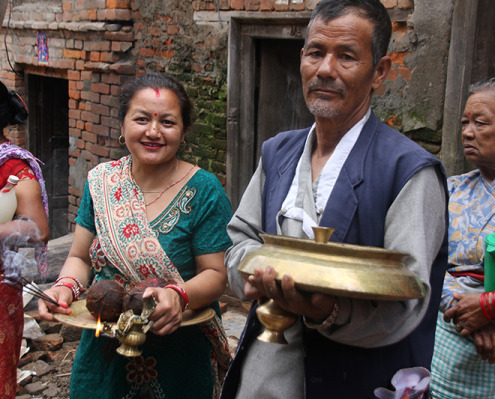 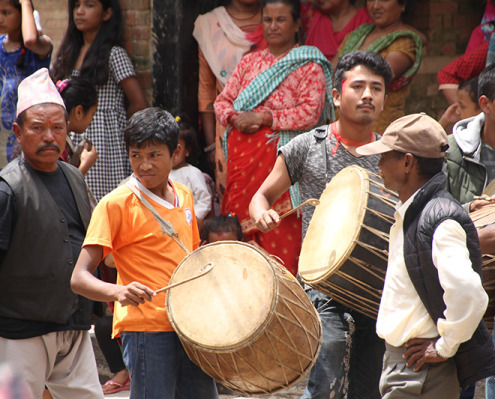 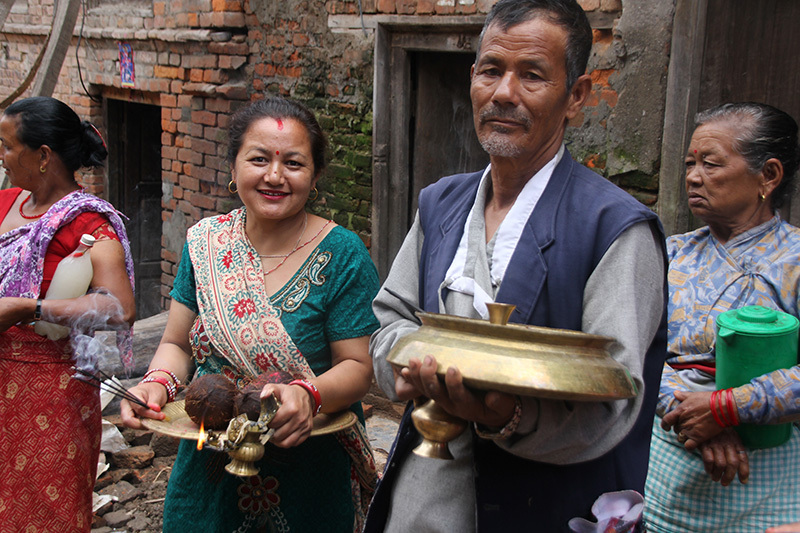 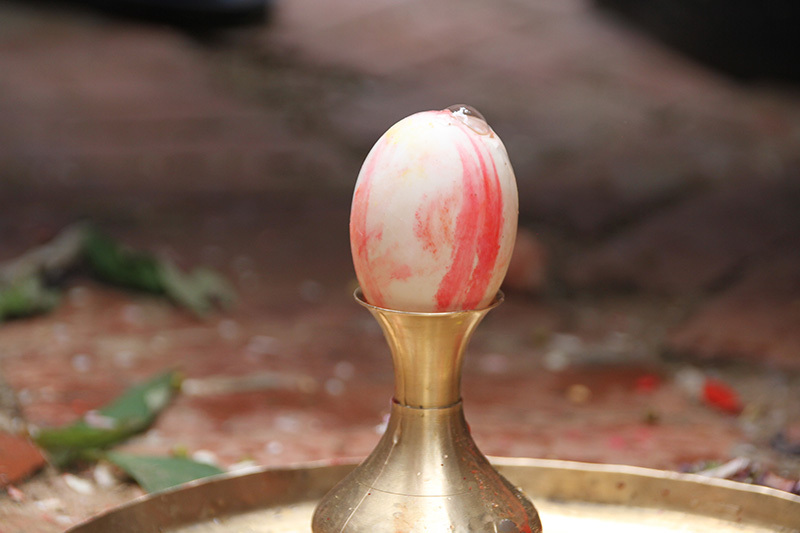 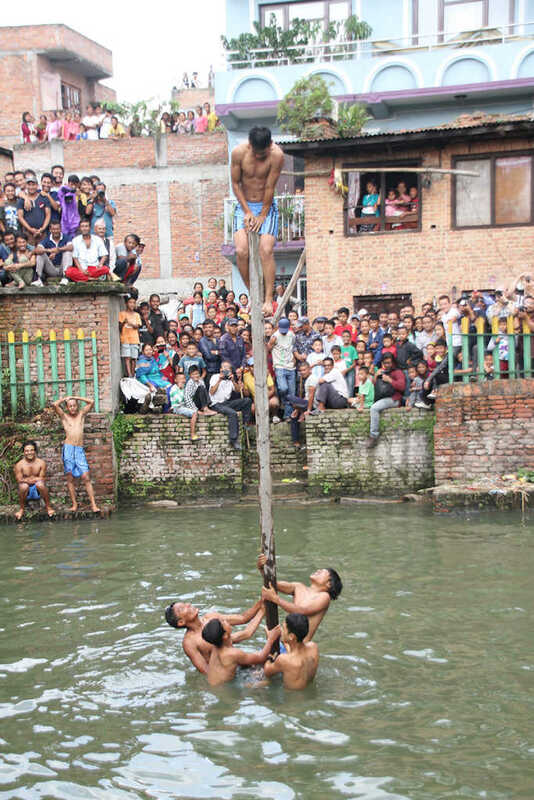 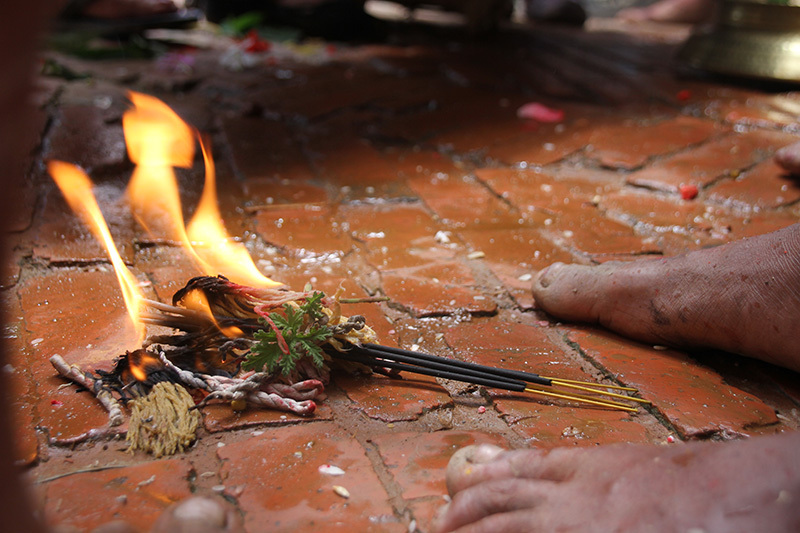 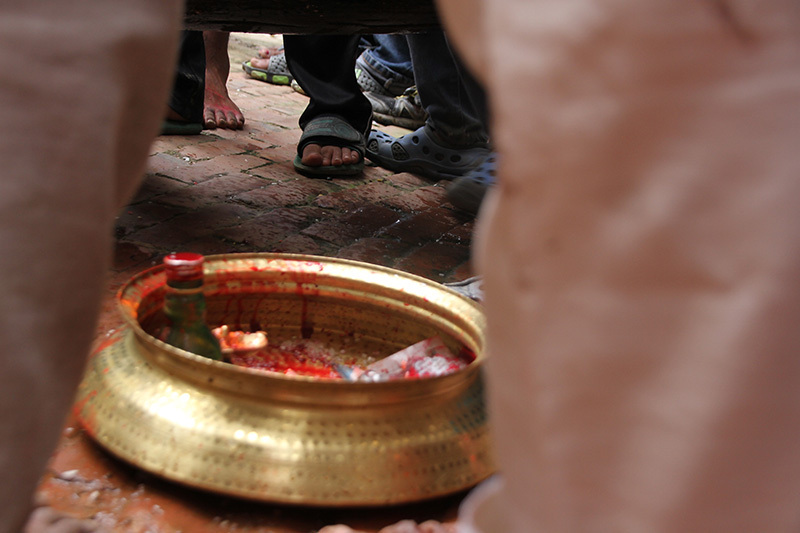 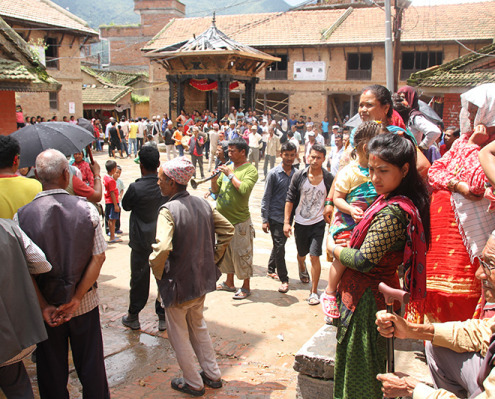 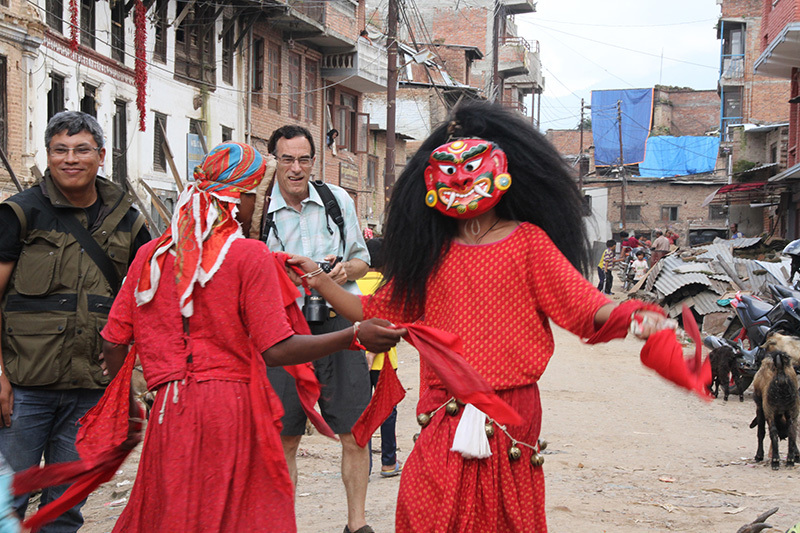 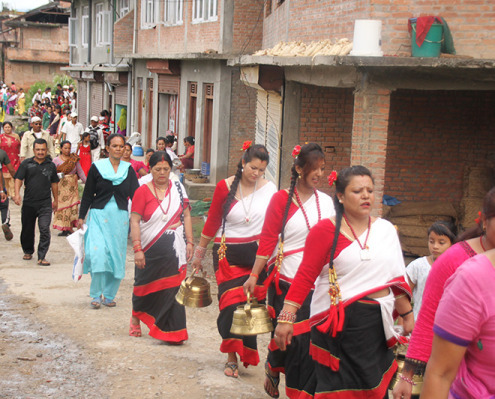 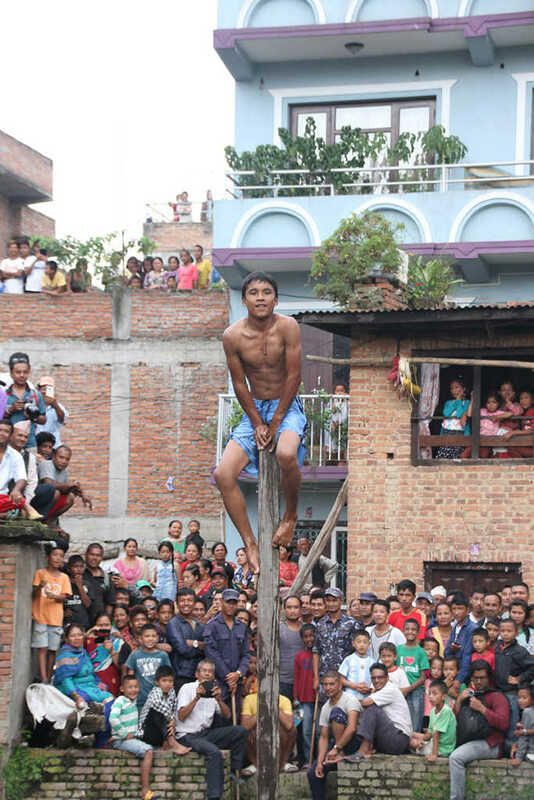 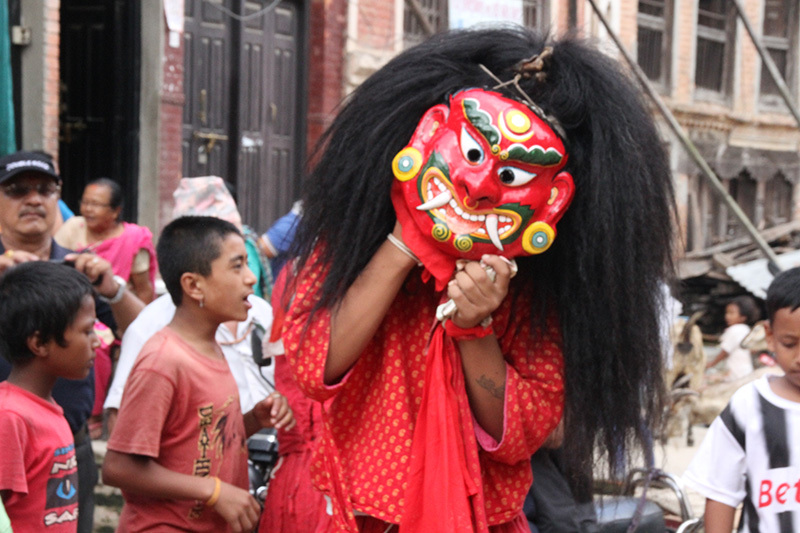 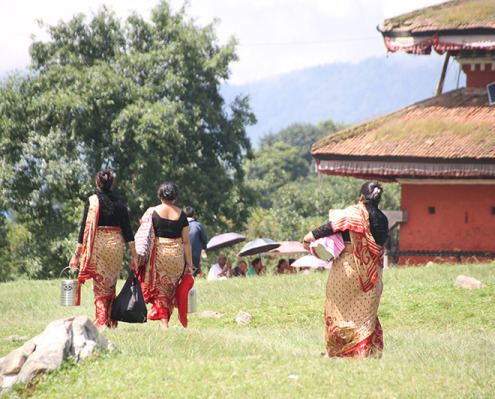 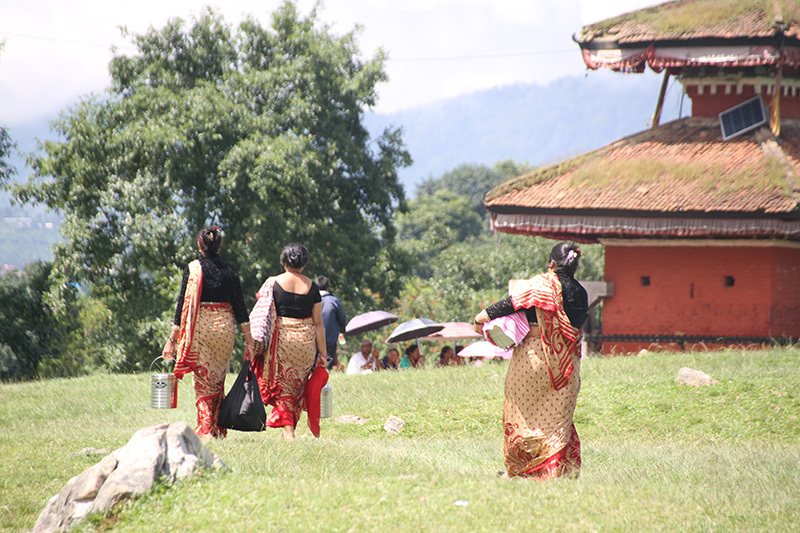 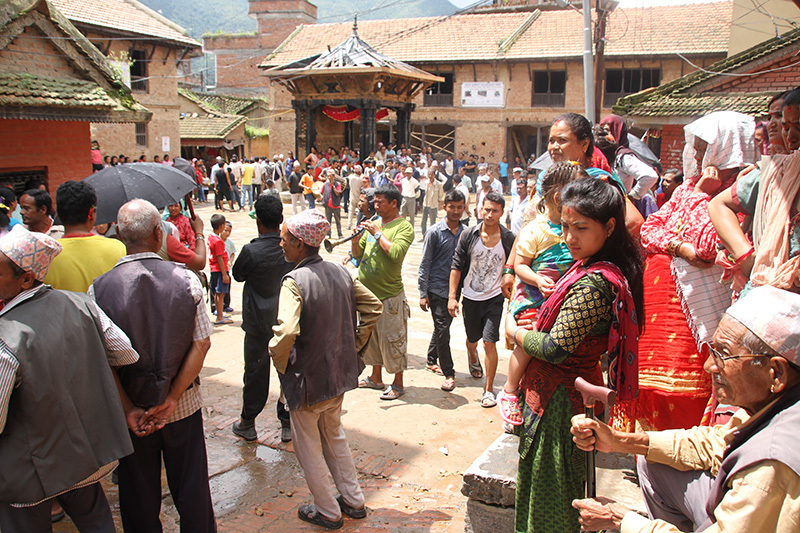 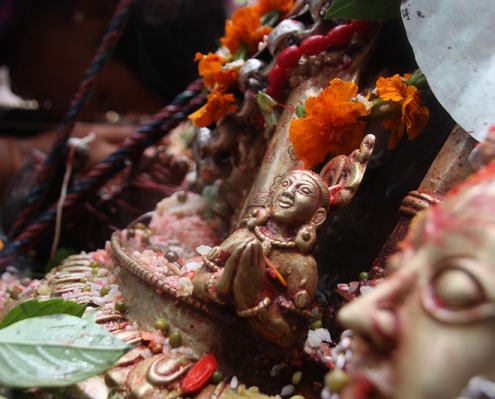 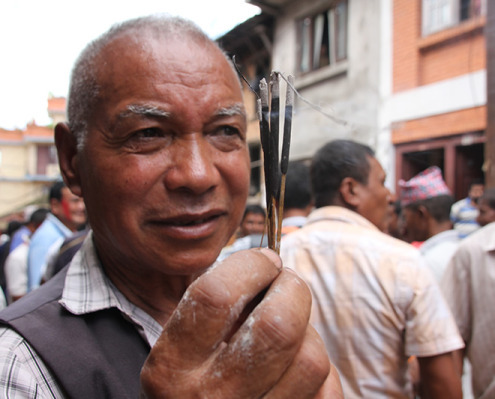 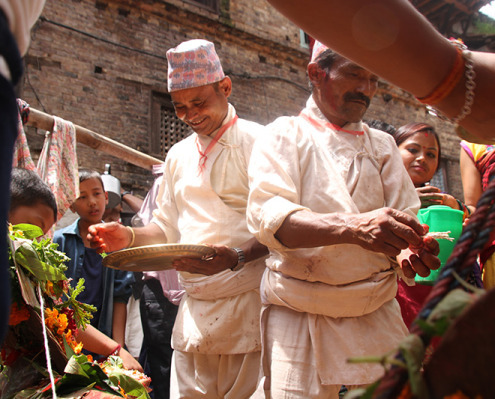 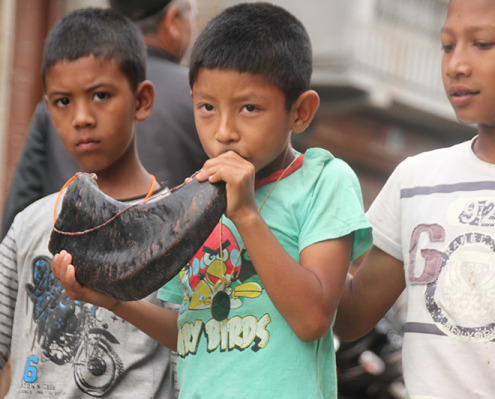 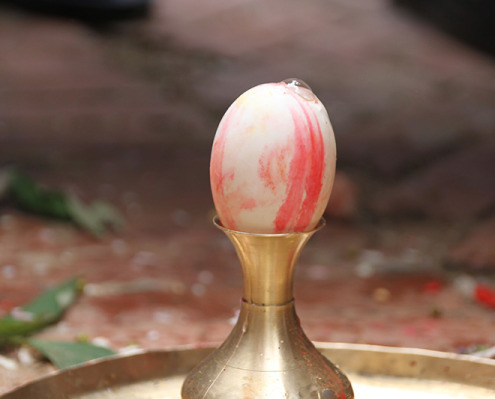 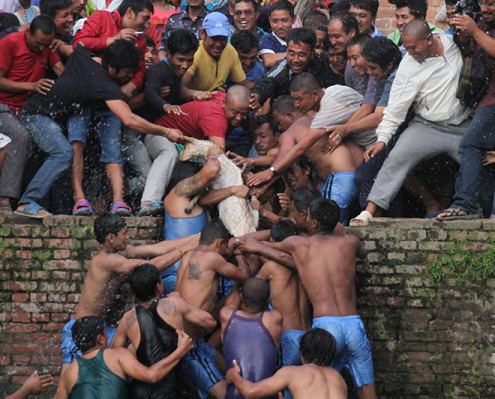 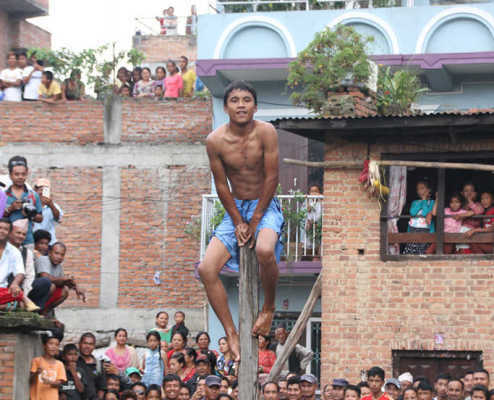 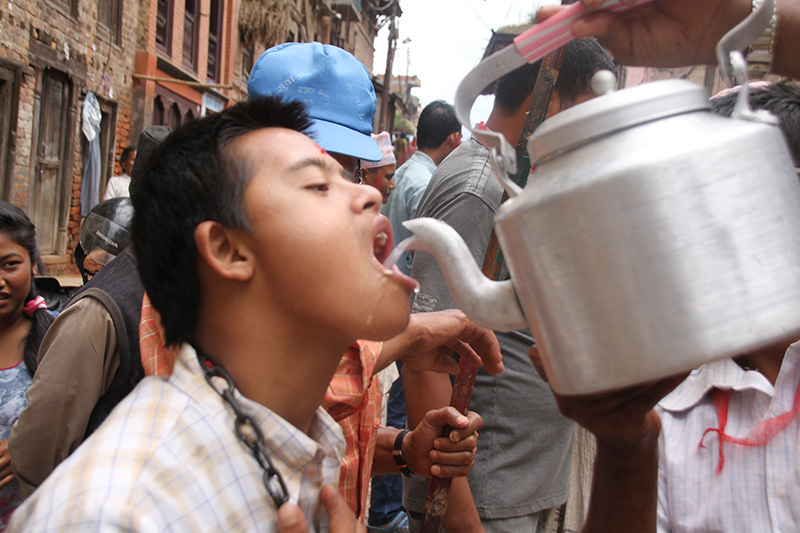 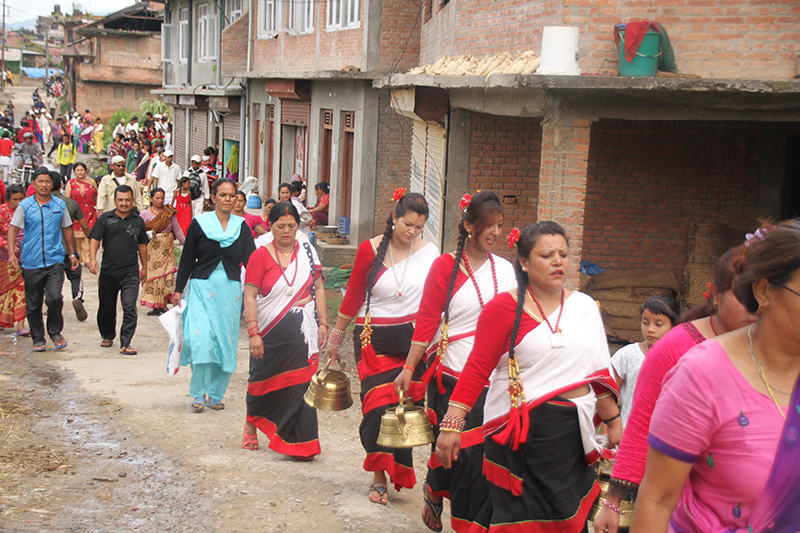 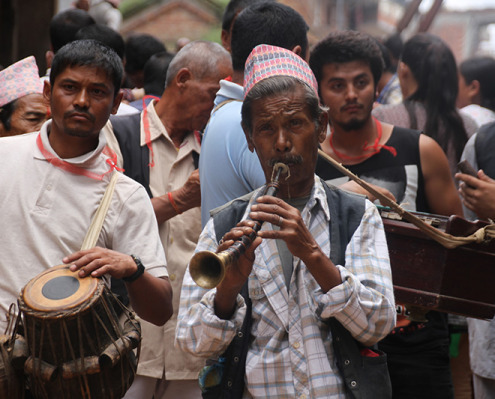 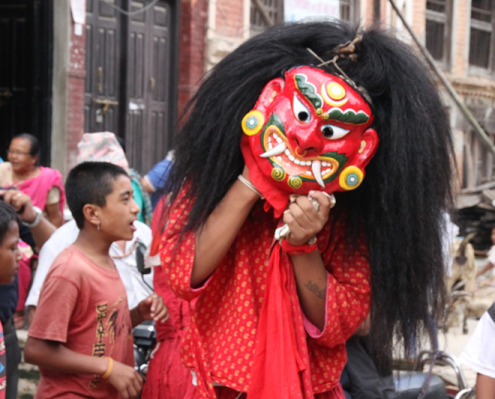 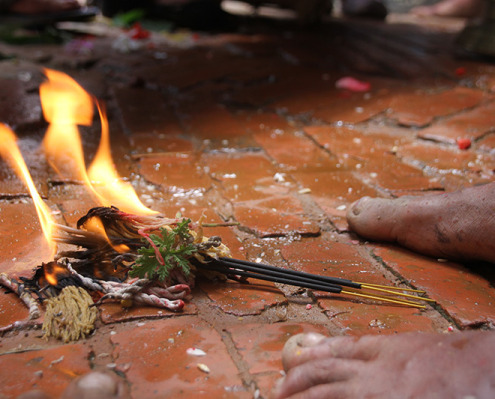 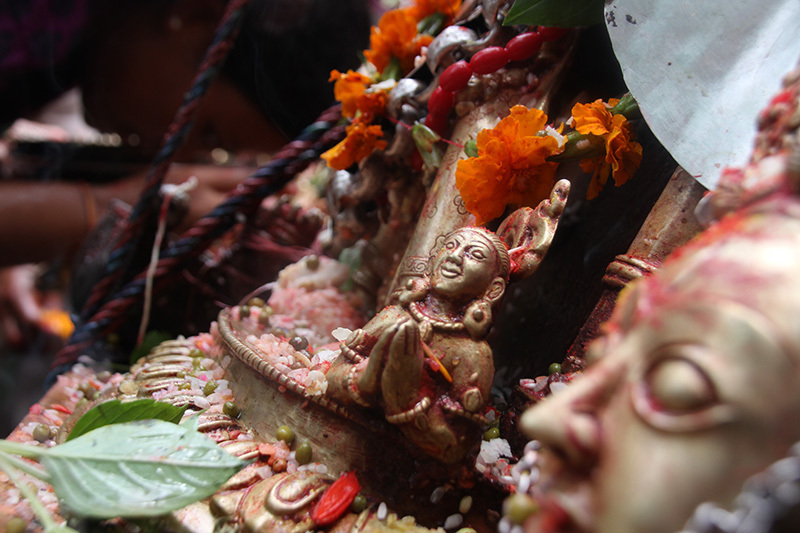 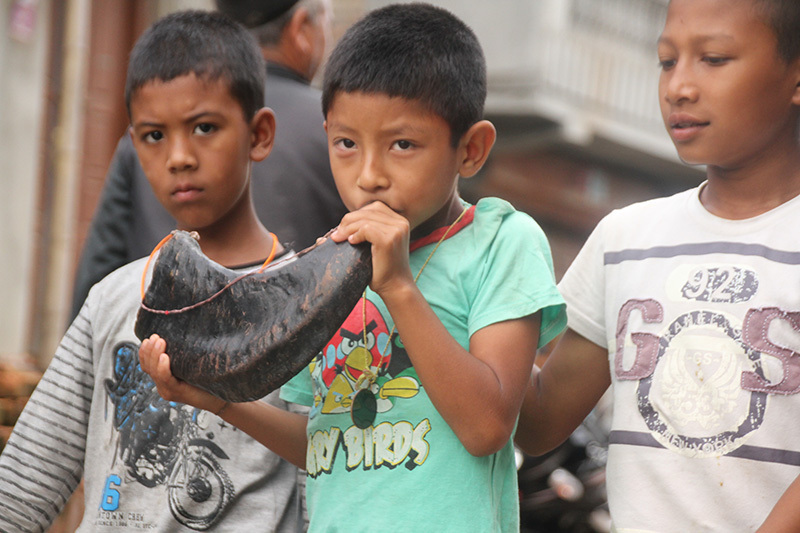 This savage ritual, that takes place every August on the day after Gai Jatra, is known as the Deopokhari festival, otherwise referred to as the Khokana festival. 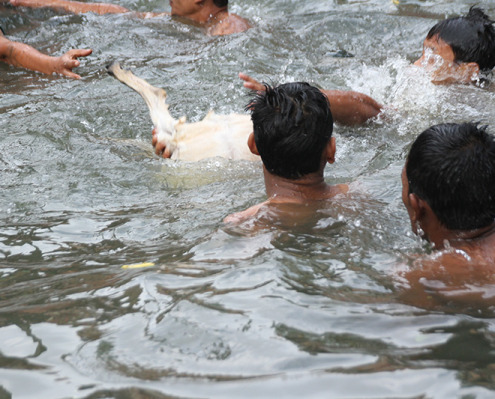 Celebrations occur over two days in preparation of the final day where an innocent 6-8 month old female goat is subjected to prolonged torture and a long drawn out death, often lasting over 40 minutes, to honor the goddess of the pond situated near the towns Rudrayani temple. 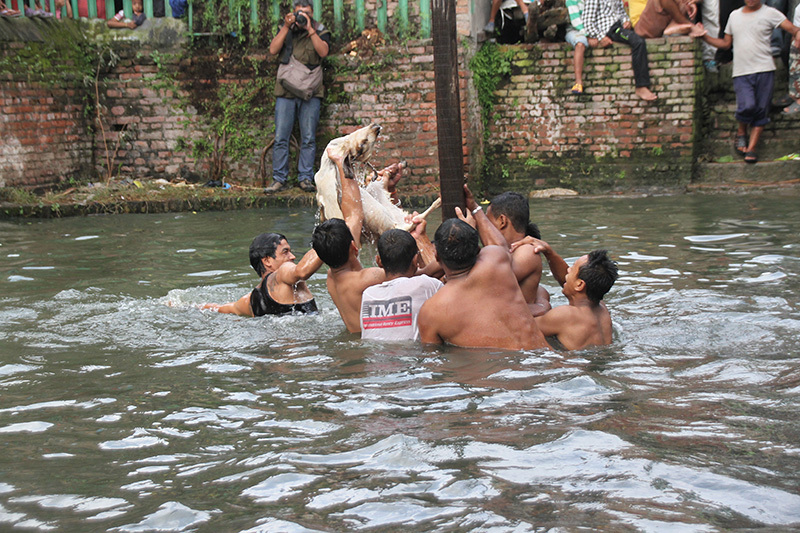 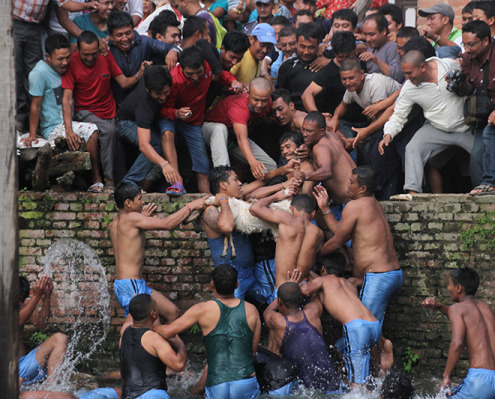 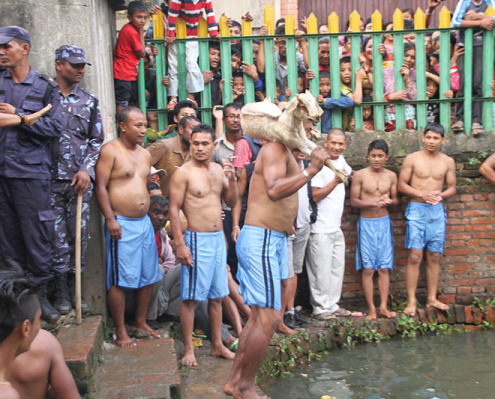 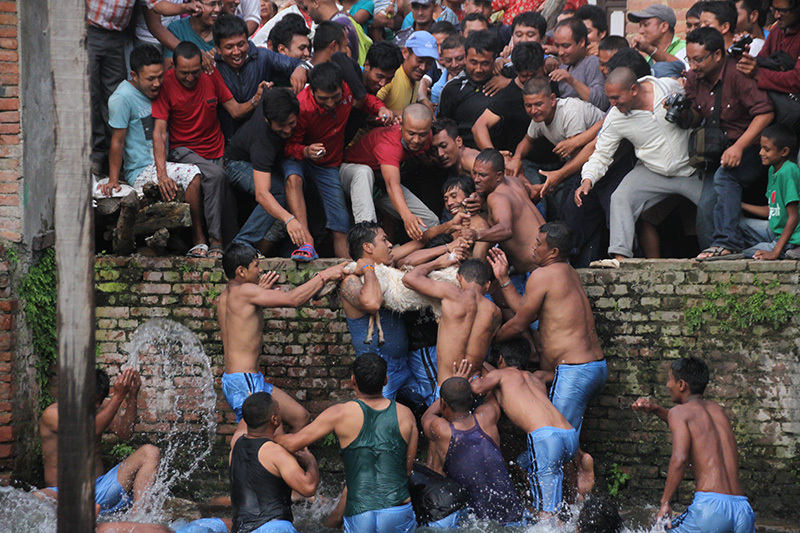 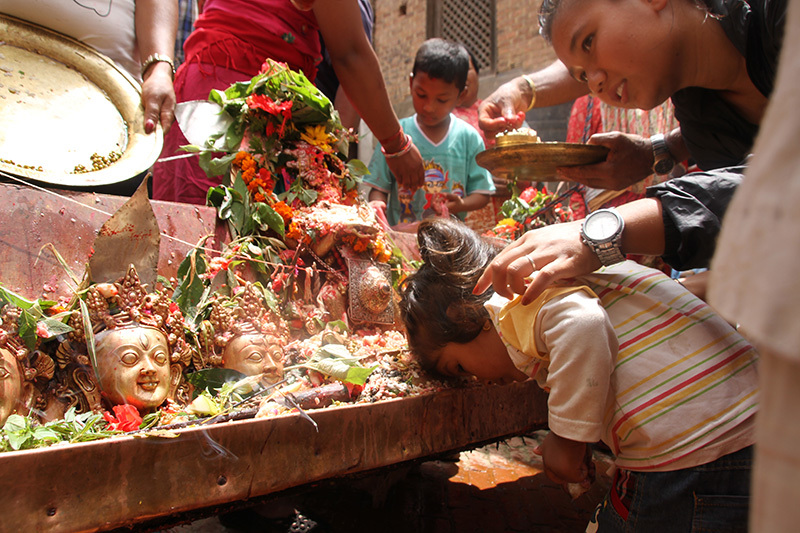 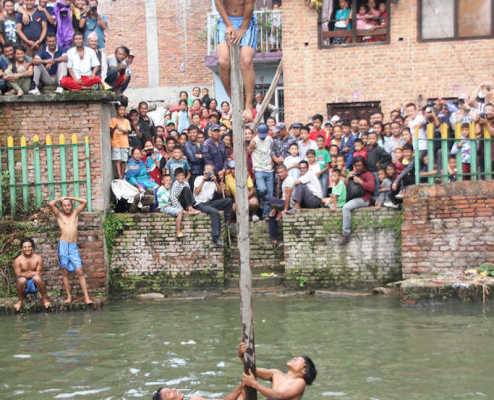 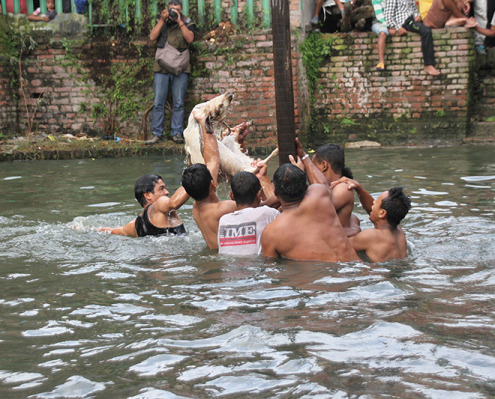 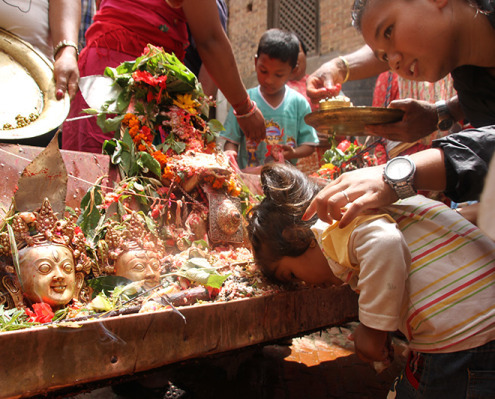 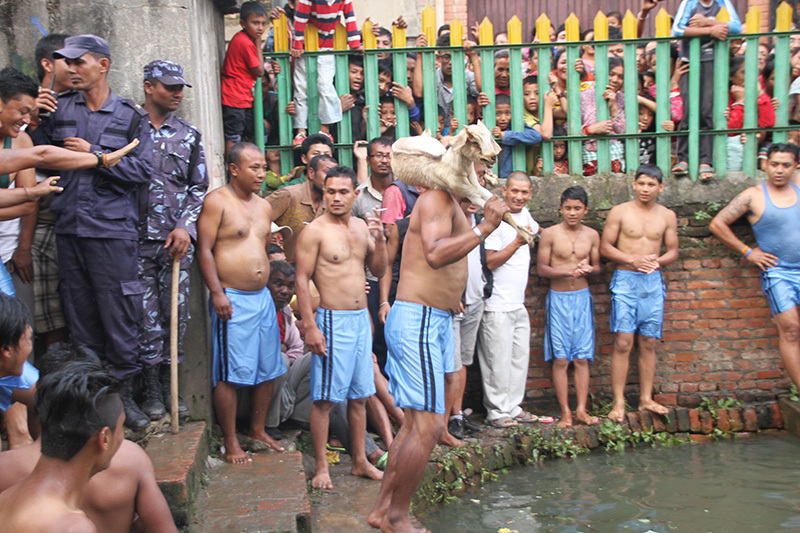 The Hindu sacrificial ceremony of Deopokhari, initiated with the legend that the gods of the medieval times drowned children in the town pond. 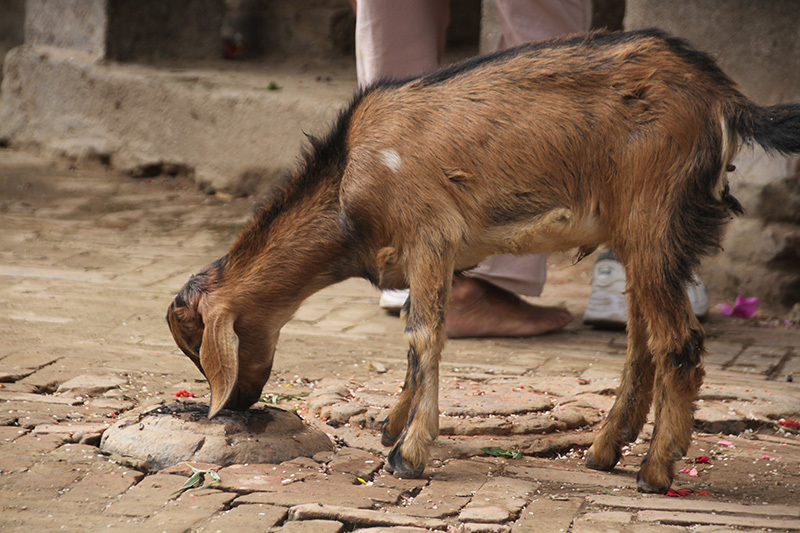 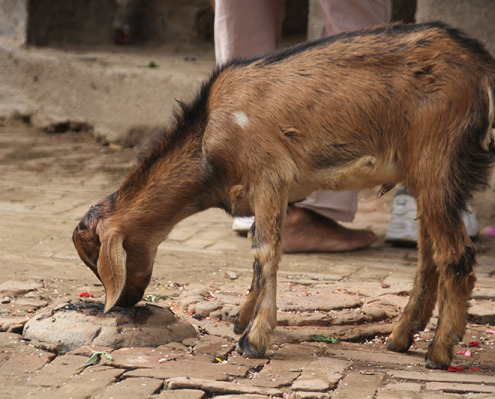 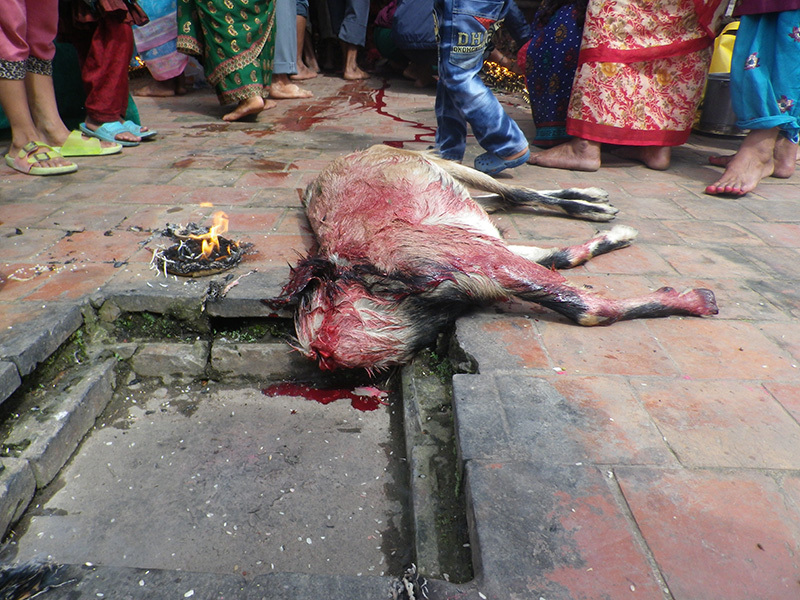 The followers of this Hindu sacrificial ritual believe that killing a goat as a kind of sacrifice will appease the gods. 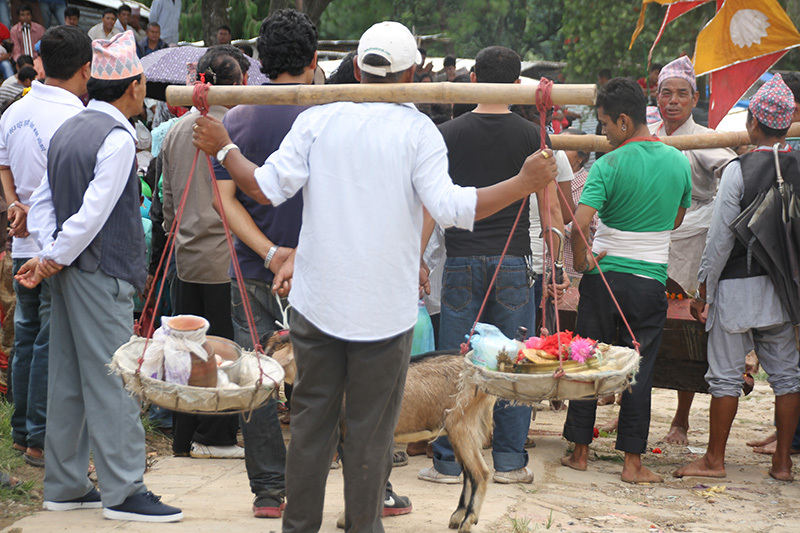 However, this ceremony involves a terrifying experience for the baby goat, who often faint form the immense pain and exhaustion they are subjected too. 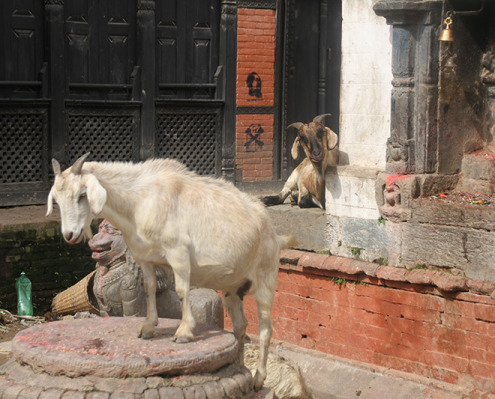 The event begins when nine village men, often teenagers, are chosen to compete in being the ‘hero’ who brings the honorable fatality upon the goat. 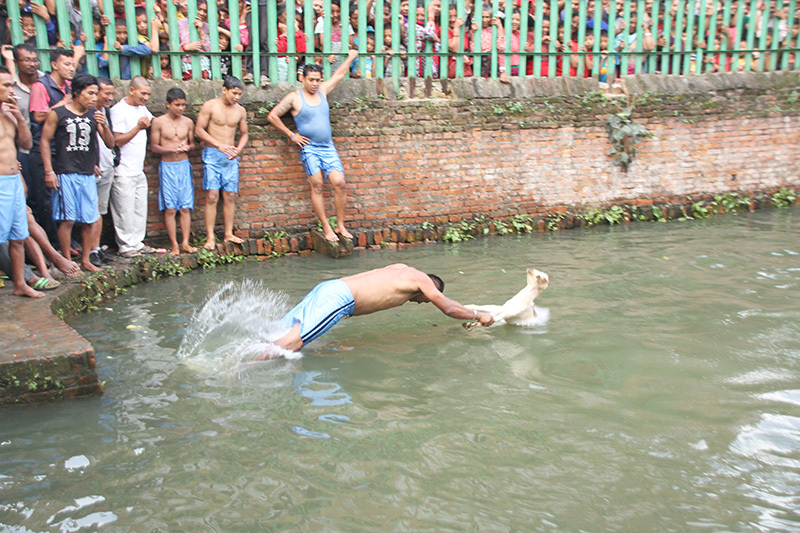 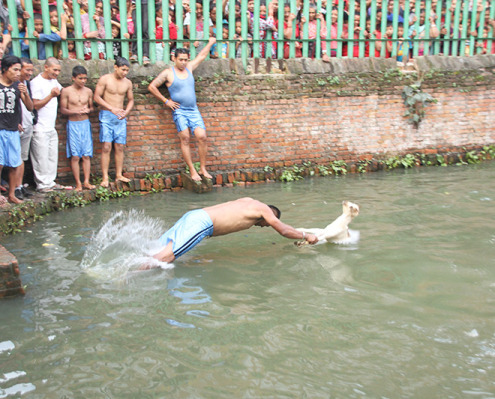 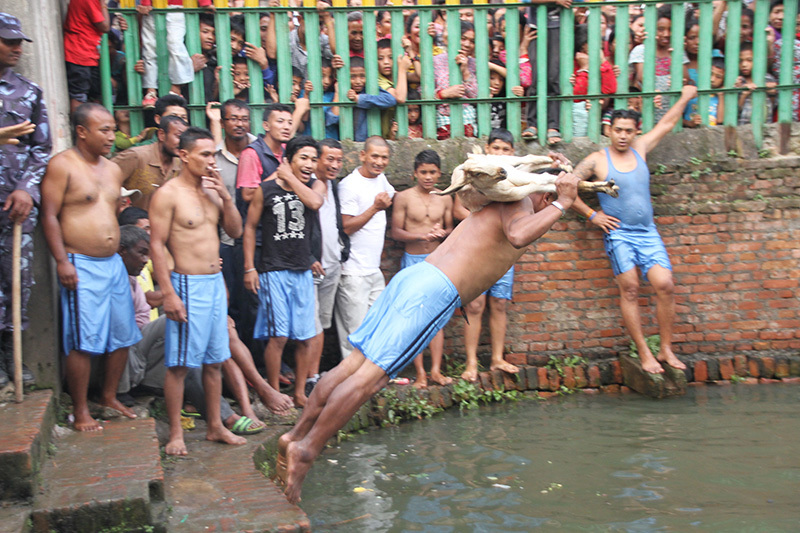 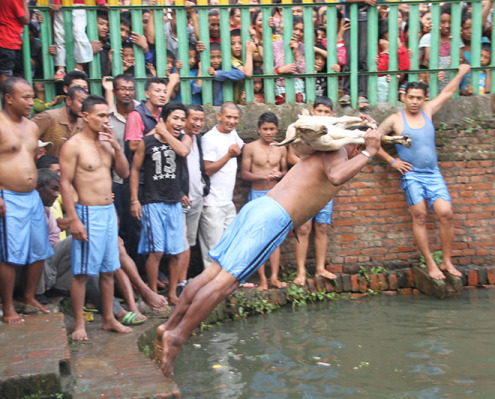 First, the goat is thrown into the pond initiating the ritual. 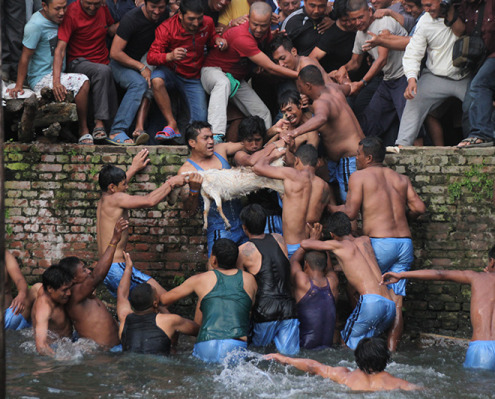 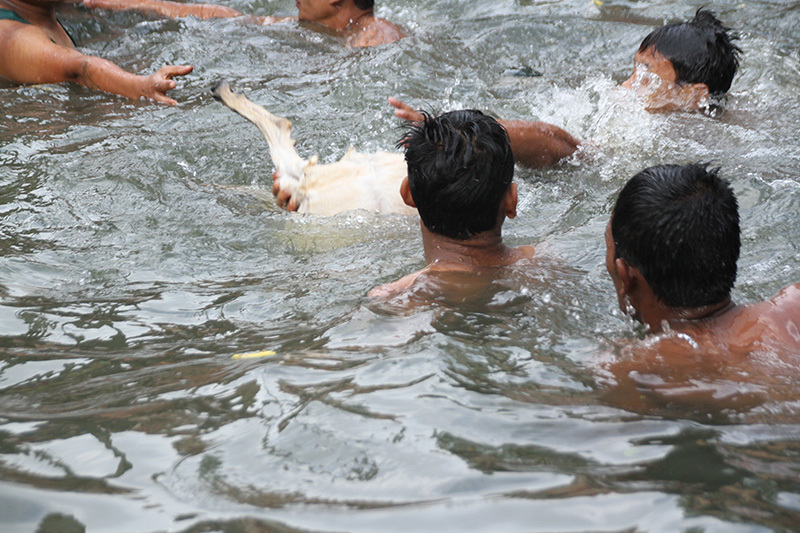 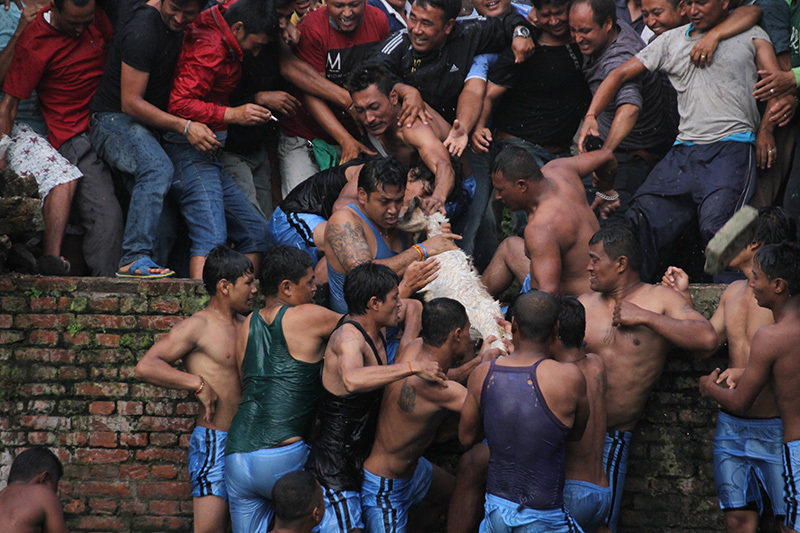 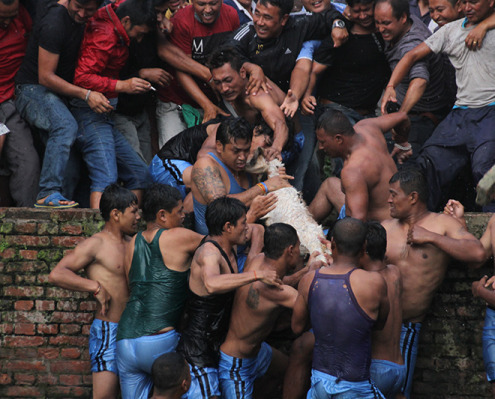 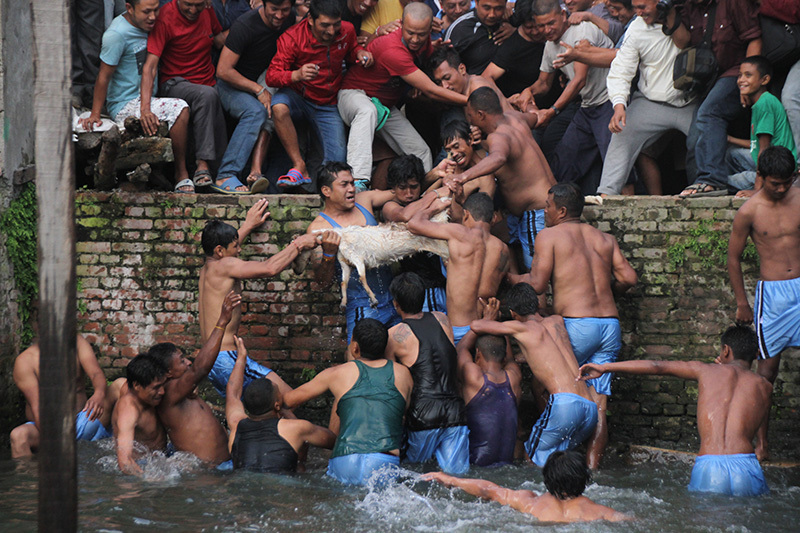 As the animal thrashes for its life in the water and amongst the terrifying chaos, the men scurry to battle for their title by ripping the goat and it’s organs apart with their bare hands and teeth, drowning and suffocating the helpless animal until the one man claims his victory and the defenseless animal is defeated in a grueling death. 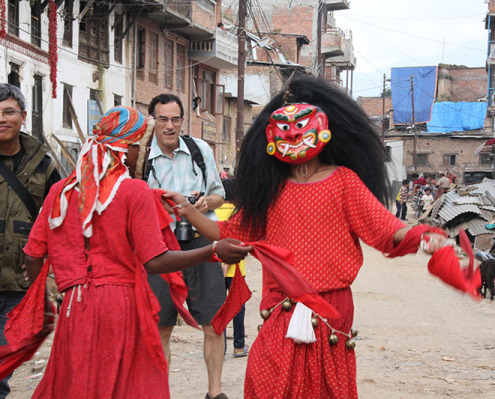 The ‘hero’ is then rewarded by leading the celebratory Shinkali dance which follows the blood curdling, satanic aftermath. 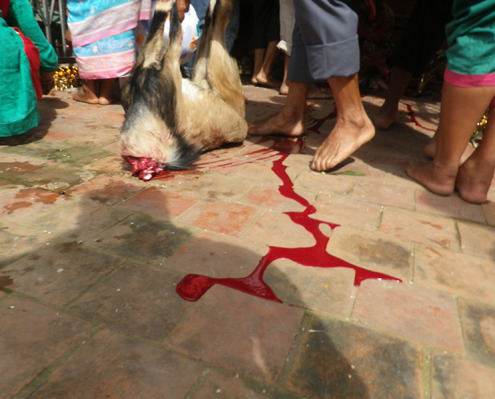 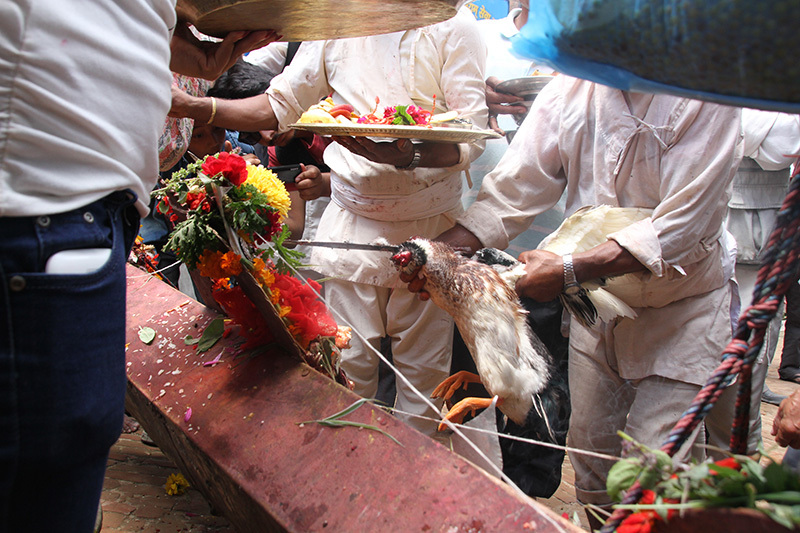 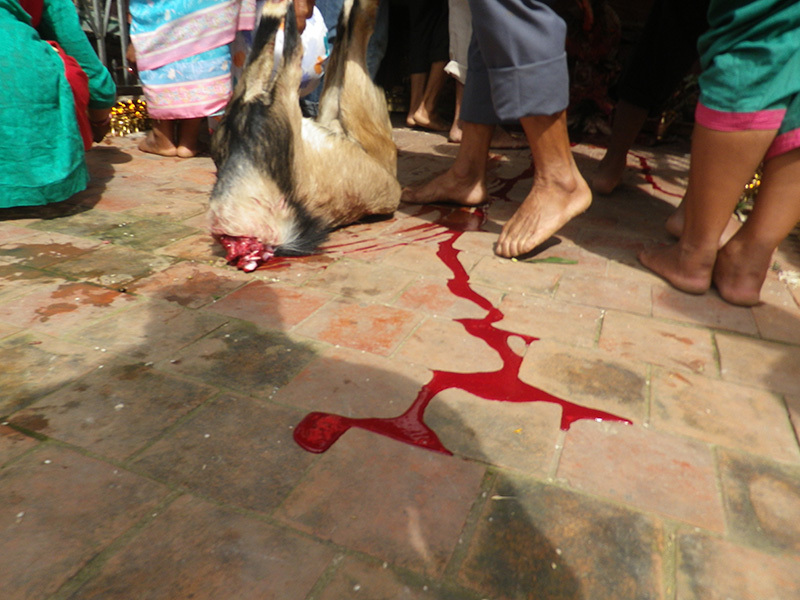 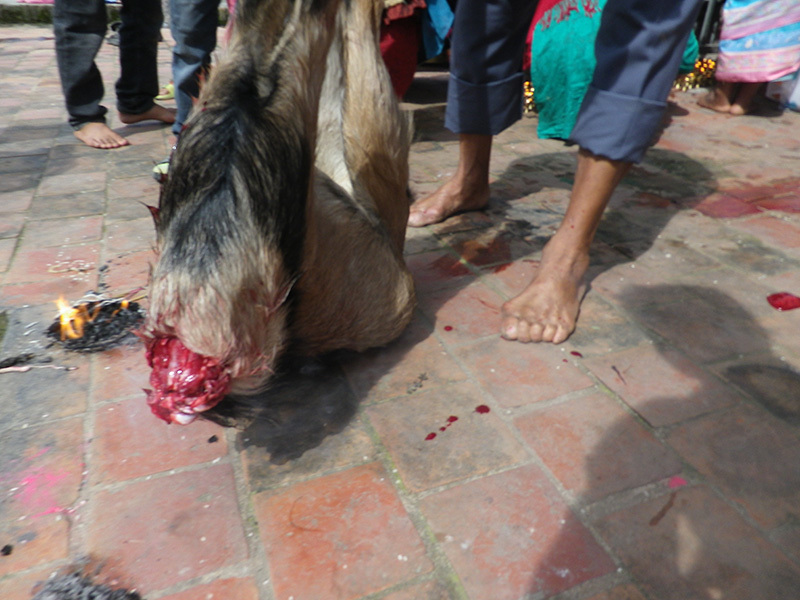 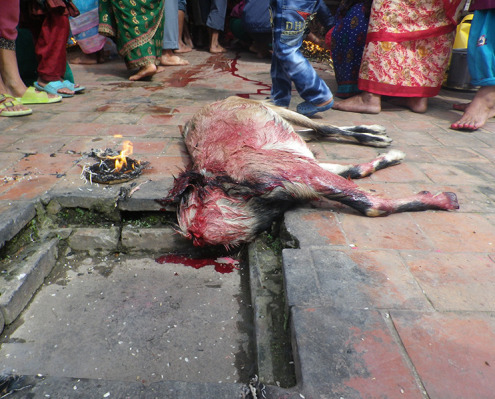 This is one of the many Nepali animal sacrifices, which leaves thousands of defenseless animals suffering to they deaths. 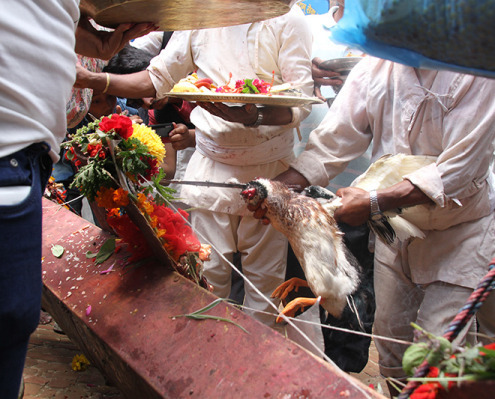 The Animal Recovery Mission is continuing it’s investigations in this country and is working with the Government and people to retract their use of animals in their traditions and ceremonies. Please click here to sign and share ARM’s Change.org campaign ‘Take action against the barbaric Khokana Festival’.